Imagine yourself sitting on the beach, watching in peace as the Mediterranean water take on its silver glow. The freshness of the somewhat salty wind and the color of the beautiful sky – those are the things that became the inspiration for Loris Azzaro to create Chrome Azzaro. The bottle and the liquid both exude the bright sunshine and infinite azure blue sky. Freshness, masculinity, eagerness, dedication, confidence; these are the qualities that Chrome Azzaro successfully projects. Chrome Azzaro is made by the Azzaro Parfums, a perfume house that is founded kind of recently by Loris Azzaro. Even though the company has just been founded, they have delivered great products. Their products are aimed at men, all projecting such a masculine aura. 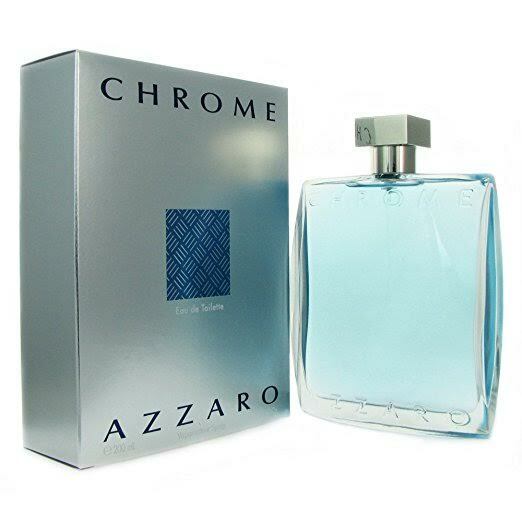 The Chrome range itself includes a variety of products, such as the Chrome Azzaro Eau de Toilette, after shave lotion, deodorant stick, deodorant spray, and all over shampoo. Meanwhile, the fragrance Chrome Azzaro was first released back then in 1996 by Loris Azzaro. Meanwhile, the marketing campaign is lead by Director Christopher Hewitt, giving the perfume such an incredibly modern feel with the highly graphic visual approach. The main idea is that this perfume delivers a true gentleman aura, celebrating the values of the unwavering bond between a father and a son, just like the one the designer Loris Azzaro shares with his grandson Romain. A villa with clean and simple lines overlooking the sea in Antiparos, Greece, becomes the backdrop for these unforgettable moments between a father and a son. Chrome Azzaro comes in an elegant and attractive packaging. The somewhat slim box is colored in an elegant metallic blue-gray, with a mysterious dark blue pattern at the center of the front side. Opening the box, you are going to be presented with a premium glass bottle. As indicated by the packaging, the bottle is slim and rectangular. The color is light azure blue and is semi-translucent, creating such a visual effect that is similar to that of the shiny sunlight and sky. The bottle has a spray cap for easy and simple application. However, the bottom of the bottle is actually pointed instead of flat, so it cannot be put in a standing position unless you put it inside the box. This design is unique, distinctive, and elegant, but not very practical. Chrome Azzaro is best described as a citrusy, aromatic, and masculine scent with fresh spicy notes. It is pretty much like what you would expect from an oceanic perfume. However, Chrome Azzaro stands out from the competition because it is a true signature scent and is very reliable. One reason is because of the exceptional sillage, projection, and longevity. The sillage is just right, decent and moderate, neither too weak nor too intoxicating. It can showcase your presence without being too bold. It also lasts for hours, making it very reliable for work and going out. Chrome Azzaro opens with a citrusy opening, as the top notes feature lemon, bergamot, pineapple, also neroli and rosemary. However, the citrusy head notes do not last very long. Instead, it makes way for the smoothening, mysterious heart notes of jasmine, oakmoss, cyclamen, and coriander. The sandalwood in the base notes provides great stability and predictability, making this scent very gentle and elegant. This perfume projects the image of a masculine, composed, yet confident gentleman. Being fresh, elegant, and mysterious at the same time, Chrome Azzaro is very versatile. It can be used for formal, casual, and even romantic occasions, as well as at any time of the year. Check the best price of Chrome Azzaro here!